Our columnist examines the special traits that set Jennifer Alfano and Liza Boyd apart from their competitors—and benefit the sport. Several people have asked me to write about Jennifer Alfano and Liza Boyd and their impact and contributions to the hunter world through the U.S. Hunter Jumper Association International Hunter Derbies. Jennifer has been 12th, second twice and won the USHJA International Derby Championships. To date she is the leading money winner with Jersey Boy. Liza has won the championship twice and been second and third. I spoke to Jennifer and Liza and to six professionals who have either helped them along the way or have been fans of their system, including the care of their horses and their careful, yearlong plans for winning the championships. Tom Wright spoke to me about their work ethic and their “incredible talent.” He said they are kindred spirits with fun personalities. He has helped both Liza and Jennifer and feels that they are so good and try so hard that you want to support them but stay out of their way. Liza said she and Jennifer have no pressure with their special mounts Brunello and Jersey Boy (whom I own). They have both won the championships, and now they can relax and have fun in that class. They have the luxury of not having to ask each horse to be perfect every time—only when it counts. She feels that “Ike” (Brunello) and “Lewis” (Jersey Boy) know exactly when it is Derby Championships, and they really rise to the occasion. Liza and Jennifer are 100 percent involved in their horses’ daily care—feeding, fitness, shoeing and veterinary care. Anyone involved with these horses would come at 2 a.m. if something was wrong. Jennifer feels that the girls and staff who are involved with these two horses are able to prepare them as well as she and Liza could. Each member of their individual teams is part of their daily care 365 days a year. Liza and Jennifer believe it’s important to be so hands on—they know if something is wrong with each horse before it happens. Bill Ellis added that it’s refreshing to see the next generation continuing the tradition of true horsemanship. Each woman’s attention to detail sets her apart from the rest of the riders. In the handy round, both women, especially at the USHJA Derby Championships, employ a strategy of “go for it full out or go home!” They have to rise to the occasion as riders and caretakers. Ike and Lewis have made them better riders. They look for different horses when they are looking for derby horses instead of division horses. Both say scope is the key. Jack Towell, Liza’s father, believes both riders have a plan a year out with the championships. They talk on the phone. They compare feeding schedules. Both horses are fit and prepared. It is not just day to day, week to week, month to month—it is a year out. He feels that the derbies have made a spectator sport for the hunters; we have never had that. There were so many people watching on USEFNetwork.com from all over the world. Both women are famous now. They’ve secured sponsorships and are household names like the grand prix riders. Although a rule to limit the number of horses a rider can compete in the USHJA Derby Championships has been discussed, Jennifer and Liza think the rides per horse in derbies and at championships shouldn’t be limited just yet. It may be necessary to make that decision five years from now. But for now, they feel the derbies have made better hunters and better riders over the years, that they have helped the hunter industry and sponsorship. Every horse is not a derby horse, but we have started to produce better competitions in the regular divisions and the derbies because the caliber of horses is so much stronger. Emil Spadone was not a huge derby fan in the beginning. He feels Jennifer and Liza have paved the way for the younger riders such as his own Morgan Ward, who placed fifth in this year’s USHJA Derby Championships. He said that Liza and Jennifer have given the younger riders someone to emulate. Morgan has always looked up to Jen as a rider and has followed Liza by watching her at championships. She tries to copy their handy rounds and strategy. Lillie Keenan (who won the USHJA International Hunter Derby Finals in 2011) says Jennifer has always been her “go to” example of a forward ride to get the job done. Her trainer Andre Dignelli told her before the handy round in 2011 to ride the course like Jen would, and she won! Spadone added that the derbies have really helped to strengthen the hunter industry. Don Stewart, who has judged both women and has judged the USHJA Derby Championships, feels that Jennifer and Liza have raised the bar. They know what it takes to win the handy rounds. They never play it safe; they ride for the 90 score not the 80 score. He feels that most riders are not going to take that shot because they don’t have that degree of excellence. Liza and Jennifer have a level of focus in the USHJA International Hunter Derbies that is equaled by our top grand prix riders when they are focusing on the big money classes, the Olympic Games or World Equestrian Games. Both of these riders feel that the USHJA Derby Championships are their Olympic Games for hunters. Ron Danta, chairman of the USHJA International Hunter Derby Task Force, believes that Jennifer and Liza are master hunter riders as well as true horsewomen. They don’t just get a leg up and ride. They sink in their saddles, and their horses’ hearts and minds become one with theirs. They know what their horses are capable of at each moment. They give everyone a riding lesson in the handy section. They don’t just jump and turn; they ride with grace and fluidity. These two women are the masters of the grand prix of hunters. We need Jennifer and Liza’s input and example throughout our sport and for the next generation of riders. Susie Schoellkopf, of Buffalo, N.Y., is an active R-rated judge for hunters and equitation. She was a successful hunter rider and now is the owner and manager of SBS Farms, a training stable, as well as the executive director of the Buffalo Therapeutic Riding Center. She’s a member of several U.S. Equestrian Federation committees and a founder of the Horseman’s Advisory Council. 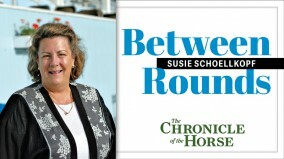 Susie’s first Chronicle column was published in November 2002.